This is no longer true. In his investigations into ‘orgone energy’ (the energy of life), Dr Wilhelm Reich developed a device called the ‘Cloudbuster’, which has the ability to induce rain to fall. to get some idea of how this may work, let’s look at the lightning conductor. A thundercloud carries a strong positive electric charge. negative charges flow from the Earth through the lightning conductor the cloud, partially neutralising this charge and locally reducing the electrical potential difference between cloud and ground. This provides local protection from lightning strikes. If the lightning conductor is earthed into underground water, the flow of negative charge can be sufficiently large to neutralise the positive charge in the cloud that prevents the moisture droplets from coalescing. Rain is this induced to fall and the destructive discharge of lightning that usually precedes this rain may not be necessary. ‘Orgone’ energy has electrical and magnetic qualities, but it is neither purely electric nor purely magnetic. It is a fairly viscous form of energy in that it tends to be localised although it also flows and pulsates. It flows from the Sun and can be stored in simple accumulators. These can be made big enough to sit in, or in blanket form to recharge one’s own energy. Orgone energy can also be modulated by pollutants and so carry their toxicities into the body. Reich called this toxic form of orgone energy ‘Deadly Orgone’ (or DOR). The ‘draw bucket’ was devised as a means of drawing this out of the atmosphere of rooms. Under drought conditions, ‘DOR’ may accumulate over wide areas, preventing the formation of clouds. To deal with this specific condition, Reich developed the ‘Cloudbuster’. This can draw off accumulated DOR, permitting clouds to form and rain to fall. The ‘cloudbuster’ consists of a set of steel1 tubes earthed into circulating water pumped from an unpolluted source in the ground. It is a larger version of Reich’s ‘draw bucket’, which is basically a set of 60cm long galvanised iron pipes standing in a bucket into which clean water is trickled and drained away to earth. Orgone energy is channelled through these pipes and absorbed by the water. Such ‘draw buckets’ are useful devices for clearing rooms of electromagnetic pollution, but they can also literally ‘drain the life’ out of living organisms, so they need to be used with caution. These have proven about 80% effective in breaking droughts within 48 hours. These devices are not only extremely potent, but they have been lethal when mis-used. DeMeo claims that o[erators need as much training as a 747 pilot to apply this technology safely and effectively. Used wrongly, the Cloudbuster can also worsen drought conditions. 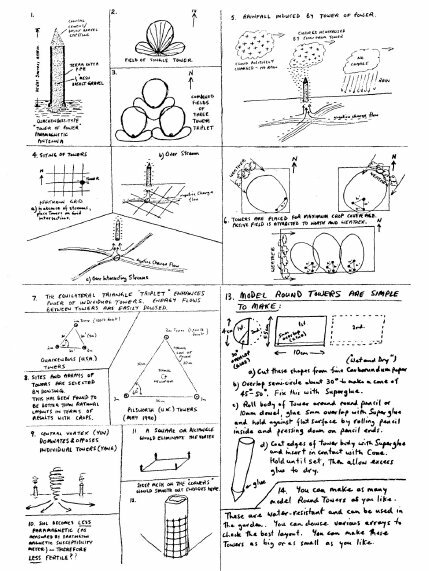 In the UK, Tom Graves has proposed that the lightning conductor and Reich’s devices had earlier counterparts in standing stones and barrow systems2. Here, the standing stone arrays are analogous to the Cloudbuster. These arrays are interconnected with barrows by water lines. Barrows are layered mounds that appear to function as orgone energy accumulators. They are not burial mounds. Tom proposes that such systems may have been ancient methods of moderating climate. Do standing stones display any energies similar to orgone energy? 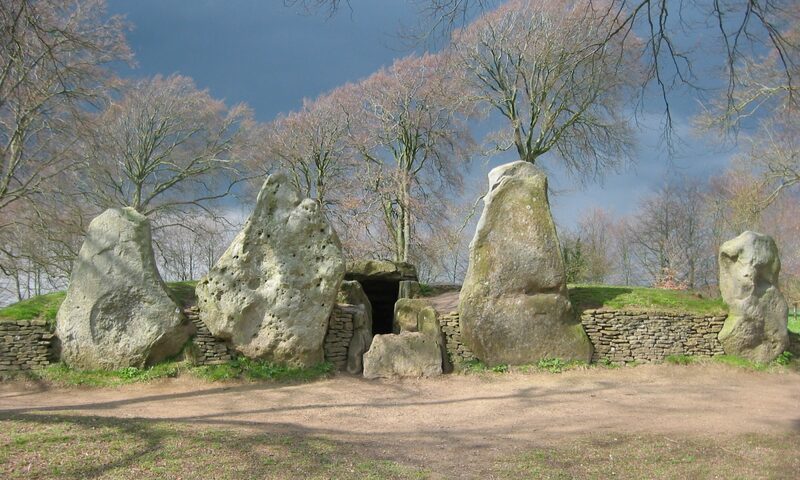 Standing stones typically emit seven bands of ley-type energy to other stones, two underground and five overground. A dowser in contact with Band 7 (top) will be thrown backwards, and if he/she leans on the stone at Band 5, he/she will be rotated about the body axis. This shows that these dowsed ‘ley lines’ are indeed physical phenomena and that they have properties in common with orgone energy as they interact with the life field of the dowser. During WWII, Sergeant Phillip S Callahan USAAF, was stationed at a radio beam station near Lough Erne in Northern Ireland. Nearby, Devenish Island with its ruined monastery and well-preserved 1,400 year old round tower attracted his attention as a ‘magical’ place to spend his off-duty hours. Callahan asked the local farmers why they ferried their cows out the the island (a difficult task in a rowing boat!). He was told, “Sure, and isn’t the grass finer on the island?” It was too – but why? Years later, Professor Phil Callahan PhD had proven that insect ‘antennae’ were indeed functional antennae in the radio sense – highly sensitive to coherent infrared radiation. Phil got to thinking about the Devenish and other round towers – could these be magnetic antennae? All the Irish round towers are constructed of paramagnetic stone, which conducts magnetic forces (without exerting a magnetic field of its own), and which also has semiconductor properties, not unlike the crystal of a crystal set radio receiver. Phil reasoned that carborundum (silicon carbide) had similar properties, so he constructed round tower scale models from carborundum paper for laboratory experiments. Placing them between a 3cm radar beam and its detector, Phil showed that these models were indeed efficient antennae. Moreover, standing waves of magnetic energy could be demonstrated in the crystallisation patterns of Epsom salts (MgSO4) when such models were soaked for 24 hours in Epsom salts then placed in the sun to dry over 48 hours. The heaviest concentration of salts on the model showed that magnetic energy was most concentrated at the top floor of the tower. Did those early Irish monks use this top floor for meditation and healing? The hollow towers with their wooden floors acted like organ pipe resonating chambers, and Callahan postulated that these were tuned by compacting paramagnetic clay in the tower base. This explains why the entrance doorways were constructed about 3m above ground. But what of the biological effects of these towers? Callahan took two earthenware dishes of soil and seeded these with radish seeds. In the centre of one he placed a carborundum paper round tower model. Both dishes were illuminated from all sides by artificial light and otherwise identically treated3. Callahan found that in the ‘control’ dish (without tower), the radish seeds sprouted uniformly, but in the dish with the tower, sprouting was not at all uniform. Most rapid sprouting and growth occurred to the North of the tower, while there was minimal growth to the South. The overall effect was of growth promotion in a cloverleaf pattern. Rood developments and net biomass were both enhanced by the presence of the model tower. Several researchers had proposed that electromagnetic energy is split in solar flares (sunspots) into magneto-electric monopole waves that are either (N:+), (yin) or (S:-) (yang)4. Knowing that an isolated S magnetic pole stimulates biological activity, Callahan proposed that the Irish round towers collect magnetic energy in the form of waves of (S:-) magneto-electric monopoles. Callahan planted more seeds inside a stone circle and found that the [attern of germination was that of the Yin/Yang symbol in the Korean flag. Magnetic susceptibility readings show that soil becomes more paramagnetic about a round tower model. Indeed, all fertile soils are paramagnetic, and diamagnetic soils are infertile. John Quackenboss (now of Alexandria, Virginia) read about Phil’s experiments and reasoned that 2m tall round tower models of paramagnetic materials should have similarly beneficial effects upon farmland. In 1966, John erected on his folks’ farm in northern Arkansas a model made from a 6ft earthenware pipe 12 inches in diameter, filled with basalt gravel and capped by a cone of concrete made with basalt gravel and coated with crushed basalt (total height 2 metres). This $250 investment produced an $8,000 yield increase in cotton and soya beans, so in the following year John erected 21 more towers. John is a dowser, and had also read of standing stones being olcated over ‘blind’ springs (water domes), so he located his towers over intersecting underground streams or on negative intersections of the Hartmann grid. Despite the drought of the following years, the Quakenboss property had plenty of gentle soaking rain and harvested the second-best crop of cotton an soy beans their history. Neighbouring properties verged on dust bowl conditions. John is currently very busy installing is ‘Towers of Power’ on other properties, so far to good effect. Alwyne monitored the magnetic susceptibility of the surrounding soil and found to his dismay that it was DECREASING, despite the rapid growth of the crops. Alwyne phones me to a) tell me that he had learned to dowse, and b) to ask my thoughts on this decrease in magnetic susceptibility. A quick map dowse showed that while each individual tower emitted Yang, the triangular array ws dominated by an intense vortex of Yin at the central point. On consultation, Juergen Schmidt advised that such triangular arrays are avoided in feng-shui for precisely this reason. Juergen predicted that this vortex would expand over about seven years, devastating the fertility of the soil, unless the Yin vortex was removed by altering the triangular array to a square or rectangle. Even so, Juergen recommended that the outer semi-circumference of each tower be shielded by attaching a strip of wire sheep mesh at the base to smooth out corner effects. Juergen said that the crops were responding to an increase in energy flow, but that in time as the Yin effect became dominant within the soil, plant disease would become chronic and soil fertility would decline to desert conditions. At the recent pendulum workshop, carborundum paper round tower models were dowsed. Even a 125mm tall tower 13mm in diameter is a very powerful device. Placed singly, we found that their greatest influence is to the South (Southern Hemisphere), i.e. towards the nearest Pole. In a triangle of three towers the central vortex dominates and opposes the influence of the individual towers very strongly indeed. Round towers (or ‘Paramagnetic Antennae’) offer considerable potential in the enhancement of soil fertility and also quite possibly in climate amelioration, once the ‘bugs’ are ironed out of the system. Here we have uniquely accessible applications for dowsing explorations which are of immense practical importance. There is not one of us who cannot make up and study the effects of these devices in model form. You may even like to construct a conical ‘thinking cap’ from carborundum paper to stimulate your brain. This useful aid was very likely the origin of the wizard’s or dunce’s cap (an act of practical kindness rather than derision). So far as I am concerned, if it was good enough for Merlin, it’s good enough for me! Towers of Power? Yes. That is exactly what they are.